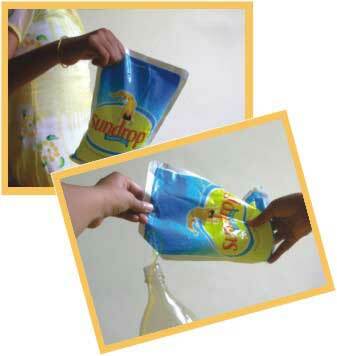 The medium sized (1 liter) liquid filled pouches like milk pouches; edible oil pouches etc. used in homes have many issues of handling. Same is the case with oil bottles. Grip: where does one hold it before and after opening the pouch? Is it in the middle or at the corner? Ease of opening: Can one open it with his or her hands only? Is there any visual instruction indicating from where to open? Does one need sharp tool to open it? Pouring: Can one easily pour the contents in another container till the last drop is extracted out without any spillage? Though issues of grip and opening do not stand in case of oil bottles but the wastage and spilling while pouring appears as an important problem. well you could use a funnel.. as simple as that..